When I was a boy back in 1971 – oh my gosh, 40 years ago – the Sandown Cup was a big deal. A crowd of 40 or 50,000, over 200 bookmakers, and the great Goondiwindi Grey, Gunsynd, carrying 9 stone 1 pound to victory over a mile and a half. Those were the good old days. Everything seemed bigger and better back then. Today the race is a low class affair over 3200 metres. The top weight is Norsqui with 57 kilograms. The ratings experts tell me that Norsqui is a lay, because of the step up in distance from last start and the rise in weight of 3 kgs. And they proved to be correct, with Norsqui feeling the pinch over the last 200 metres, but just hanging on for third. 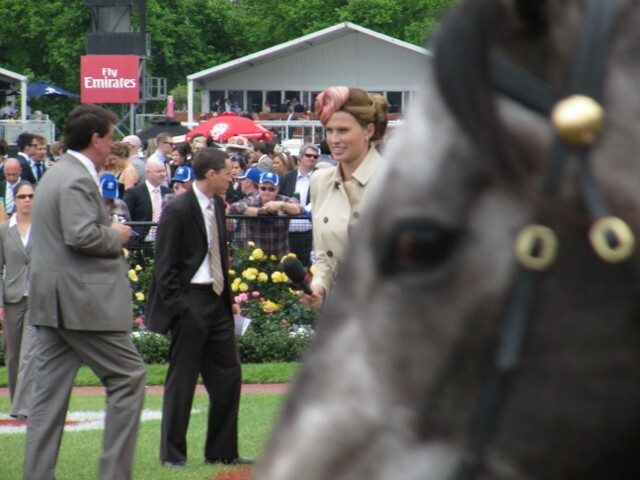 I didn’t back the horse, but there was a lot to like about his mounting yard behaviour. 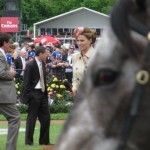 He was prancing around, head in towards the strapper, with a slightly arched neck. These are all good signs. The only thing you need to forgive him for are the red winkers! I was there. 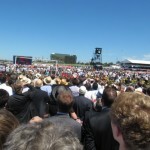 I was one of the 85,112 who witnessed Black Caviar in another historic exercise gallop. But the trouble with so many fans trying to look at the champ is that I couldn’t get a decent look at the other six contenders. Too many midget jockeys in the way. I think $4.40 for the place paid on Buffering was an opportunity that went begging. But I covered myself in glory with three out of three placed horses – Con Act, Secret Admirer and Shoot Off. I finally broke out from being positive to well ahead for the spring. I think it’s time now for me to forget Francesca. Sure she has a double degree, is articulate, can ride horses, write and look good, but her mounting yard comments seem to be mainly based on her prior knowledge of form and breeding rather than the horse’s actual appearance in the yard. Maybe a horse bucking its brands off does feel very well, but as a punting proposition, it makes me very nervous. And I’m feeling sorry for Sam Hyland, who normally does the mounting yard reports for TVN. Sam was bumped from the yard and forced to watch the horses in the parade ring from an eerie on top of the horse stalls. I took his photo so that he doesn’t feel too left out. But we both agreed that Francesca probably beats him for looks. It’s freezing. So cold that the battery on my camera gives up the ghost, just as I caught a glimpse of Francesca. A losing day coming into the eighth race, when the hot favourite, Master Harry, starts to misbehave in the yard. Winkers, head up and changing stride, resisting the jockey. Overaroused. All over the shop. 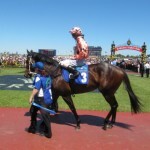 He is $1.28 the place with books, an easing $1.40 on the tote and $1.45 on Betfair. I oppose him for the place. How sweet it is when he struggles into sixth place. My first lay for the carnival. I just got out of gaol. There was a time when two strappers leading a horse was a rare sight in The Cup. These days, with all the internationals, it is common. But the locals are picking up on it. 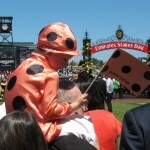 Lloyd Williams uses two strappers on all his horses, and other trainers are following suit. In the book it is a mild negative, but now it has turned the corner and is a positive. Today, Americain, Manighar, Unusual Suspect, Lucas Cranach, Lost In The Moment, Modun, and At First Sight were all led by two strappers, and still I could have missed some with two circles of horses in the mounting yard. With so many strappers it was a wonder there was room for any horses. Dunaden looked good, but I marked him down for the nose roll. 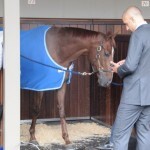 The standout in the yard was Red Cadeaux. Lucas Cranach had the bar plates off which was good, but foot problems are always a worry. I ended up backing Niwot, following my money from Derby Day. Five bets for two collects (Vintedge, Little Surfer Girl) and three losers (Adroitly, Niwot, Éclair Mystic), but still a positive day. 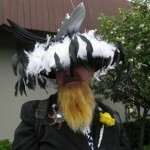 Best hat was no contest and clearly deserved by Mr Very Impressive with his Titanic creation. And I can report a Francesca sighting.